Happy Monday everyone! I hope you all had a lovely weekend, I know I did! SLC is currently experiencing a spring teaser. Lots of sunshine and high 55’s, so incredible! Although, I could use a few more beautiful snow falls before spring official begins. Until then, you can find me coatless and in bright colors! Thanks for reading! Love this look and the pop of yellow is perfect!! Loving that scarf! Just the right amount of neon. Beautiful look on you. Love your scarf. Hope you had a wonderful and restful weekend. Beautiful and right casual outfit! You’re outfit is perfect for that weather!! Loving all the yellow neon you’re wearing. Cute casual look, love he pop of neon. Adorable casual look. The heels look to die for. Beautiful look! Love the neon! Minnesota has been darn cold, so I’m jealous of your jacket-free weather! Love it! We had a spring teaser here in the midwest too…didn’t last long. I bet we’ll get more snow, but I wish we wouldn’t! I would rather prance around in some fabulous neon heels like these! Love this casual but chic look!! Adding pops of bright colors to a look, always makes an outfit that much better… Gorgeous.. 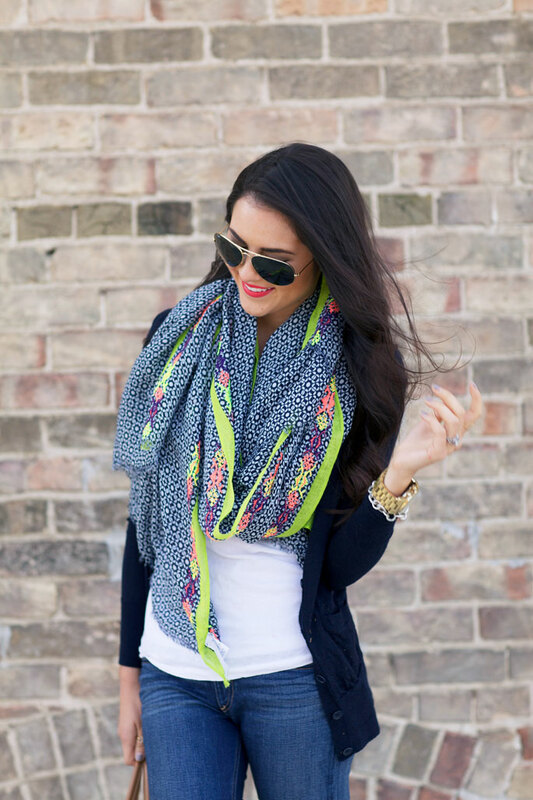 I love the bright detailing of the scarf and your neon heels… definitely gives a normally simple jean outfit a twist! Fabulous transition look!! In love with navy and neon!! Loving this look. So ready for spring! I love the outfit! Totally fits the weather! Absolutely love the neon pop! Love this casual look. The lovely print scarf with the fun pop of color with the shoe was a great touch. Love the pop of colour! Stunning! Love those pops of color! Obsessed with this outfit! The scarf and heels are such cute, bright touches! Love this entire outfit! Great job always adding a bold color to your outfit posts! I love those shoes! They really make the outfit pop. Yet another pair of shoes on my ‘I want; list… it’s growing by the day. But these would be lovely to wear in the UK in the spring and summer. Nice look :) love the colors! This scarf is amazing. Love how you manage to look casual and bright! That J Crew scarf is beautiful! What fabulous details! LOVE this scarf with those shoes! 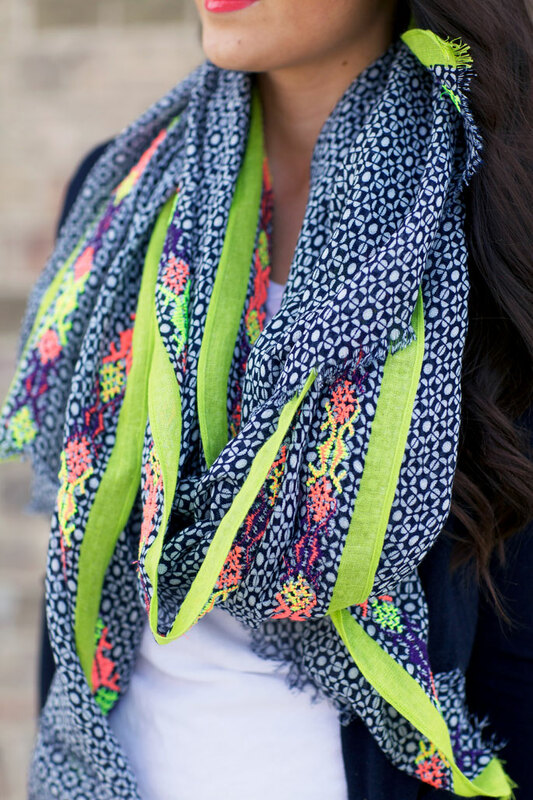 Such a great pop of color and the prints on the scarf are gorgeous! Great look. I love the scarf! Love the pop of neon! that scarf is gorgeous! Great pop of neon yellow! I love it with navy jeans. And your scarf complents perfectly! Love this outfit and the pop of colour with the neon. Gorgeous scarf! Love the neon. You look great, Rach!! Loving navy and neon these days!! This is such a great casual outfit. I love the neon accents, they really brighten up the look nicely! That scarf is SO springy and fun, I love it. This might be one of my favorite color combos for spring! Thanks for sharing…this is perfect! Love this casual look and the pop of neons are to die for! Love this look! I’m always looking for new ways to style my hot yellow pumps! I just finished ordering that beautiful J Crew scarf. I’m in love with all the colours! I have a similar YSL lip colour, too! Thanks for the spring inspiration! Love this look, Rach! I miss warm spring days soooo badly (I’m a New Yorker). This outfit makes me even more excited for Spring to come! Love it! THAT SCARF! I’m swooning, it is perfection!! I am perfectly okay without seeing more drop of freezing precipitation between now and spring. SO, so, ready!!! This outfit is the perfect spring inspiration! I’m loving the pops of color from the heels and the scarf! Great look Rach! Love the combination of the bright neon yellow shoes and scarf – perfect for spring! That scarf with the shoes is beautiful! Can’t wait for spring here in Chicago. 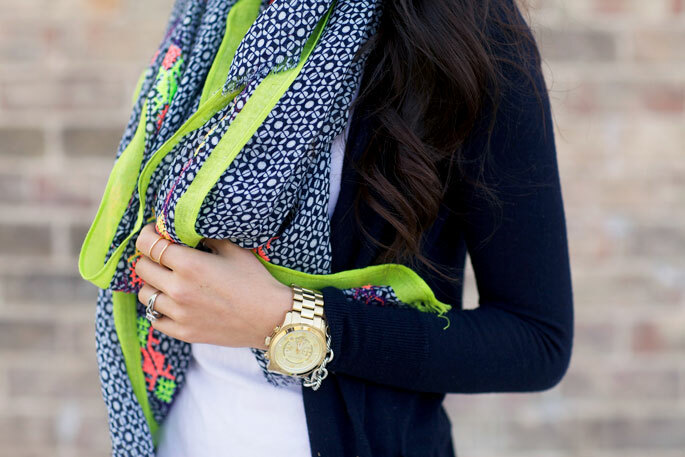 pretty scarf with that navy cardigan! So cute!! Those shoes are incredible! Isn’t it funny how 50s feel warm after winter and super cold after summed? ;-) I love that scarf and pop of neon! Love the bold pops of yellow. I am getting so excited about spring, too. It’s almost 70 degrees here today and I’m in love! I absolutely ADORE this outfit! I have been following you for a couple years now and this combo is one of my favorites. I’m not sure why I love this so much but I do! Keep doing what you do and inspiring other fashion bloggers. Great outfit! I love the schall! Love this simplicity of this outfit and the pops of color in your shoes and scarf. Oooh I love the bright accents! I love your gold ring-where is it from?! Loooove that scarf! So perfect for this Winter/Spring transition weather! Loving the coordinating scarf + heels! You have the best legs ever! I absolutely love those neon heels. Great look. I cannot wait for spring to come and stay here in Texas too! They have similar scarves at American Eagle, believe it or not.. So vibrant! Absolutely in LOVE with this look. I love my neon yellow heels and I can’t wait to bust them out again once the weather warms up! Thank you for the inspiration! seriously love everything about this. Gorgeous look! Love the scarf and shoes how they tie in together with the fluro. love the bag! I just posted about a great sale with bags originally $50-75 now on sale for $25! I have to say, this is my favorite outfit that has been on this blog yet. It’s so classic and simple, but the coordinated neon gives it SO MUCH in terms of impact. Love, love, love it. Counting down the days until Spring arrives here in Toronto! This outfit is the perfect transition from the cold weather to warmer temps. Love it Rach! Wow, this post is pleasant, my younger sister is analyzing these things, so I am going to tell her. Such a pretty look! Love the scarf and the shoes! I’ve been searching for shoes similar for the longest time! Gorgeous outfit, Rachel! so beautiful, and bright! love the colour combo! so spring like!!! You look pretty and stylish! Love that scarf with those shoes! Such a simple and great look for spring! You’re getting me excited for warmer weather, but it’s not looking good here in CT! Love that scarf!! Oh my gosh, that scarf and those shoes… perfection! Oh I love this scarf! Gorgeous gorgeous outfit- love the pop of yellow. Such a great outfit! Love the punches of color. I LOVE the scarf! It is absolutely gorgeous! Love the neons with the navy blues! Gorgeous! Cute! what size are you wearing in the cardigan? Another amazing look! I would love to raid your closet. Love this casual look! The color really pops against the neutrals.